It is "inevitable" that Daniil Kvyat and Daniel Ricciardo will receive grid penalties at Monza, according to Red Bull team boss Christian Horner. The Red Bull duo have already been on the wrong side of the engine allocation rule this season as they dropped 10 places on the grid at the team's home race in Austria after using their fifth power units of the campaign. And they are in for similar pain at the Italian Grand Prix in a fortnight and you can bet on both drivers finishing in the points at Paddy Power. "I'm fairly certain we'll be taking new engines with both cars," Horner said. "Considering the amount of races left it is inevitable we'll be staring down the barrel of probably our next penalty. Strategically Monza is the most likely. "We don't want to be going into Singapore with old engines or any risks as that is really our next chance to shine." You can bet on Red Bull to be back on the podium in Singapore and more at Paddy Power. Kvyat followed up his career-best P2 at Hungary with another impressive fourth-place finish at Spa on Sunday, but unfortunately Ricciardo was forced to retire due to an energy recovery related failure. 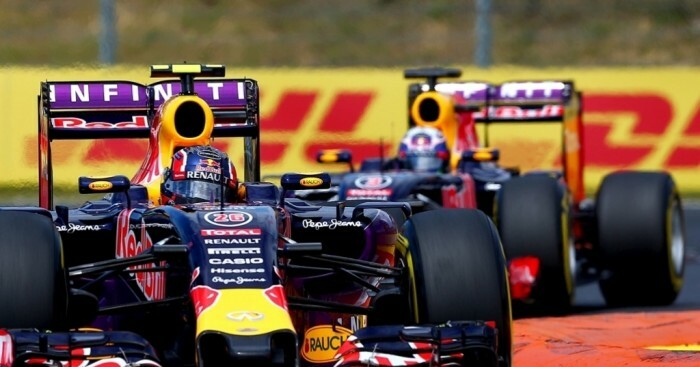 "I think for Daniil Kvyat, he drove a strong race," Horner added. "I thought our strategy was good, going soft then hard and then on a soft set of tyres. So to go from 12th to 4th, at this track, is beyond our expectations. "It is a shame for Daniel Ricciardo as he was effectively running the same strategy but was further up the road. "I think he would have been fighting for the podium with those guys ahead of him."